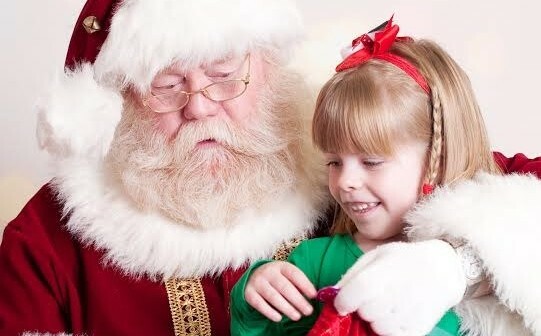 After some clever coaching by Mom, the author’s daughters have fully embraced the concept of giving and helping others at Christmas time. Of course, Sophie (top) and her sister, Katherine (above) still enjoyed visiting with Santa and sharing their Christmas wishes with the Jolly Old Elf. 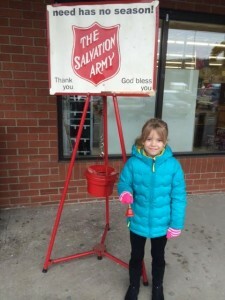 But Katherine also took to bell ringing for the Salvation Army’s annual Red Kettle Drive and suggested afterwards that kids can are great donation magnets. I understand the excitement Christmas brings, but I do not like the “gimme, gimme, gimme’, “I want, I want, I want” that comes with it. My girls know the story of Christmas and the baby Jesus and why we celebrate this time of year, but they also get caught up in the commercial side of it as well. I have seen more articles from other mom bloggers about similar experiences and read as many as of these as I can, hoping to take something from them that I in turn can use in our home. One family did away with Christmas gifts entirely, because the boys were fighting all the time and misbehaving. The parents decided their boys needed a lesson and they took the money that would have been spent on their gifts and bought gifts for those in need. They still decorated their home and the boys did receive gifts from their grandparents and other family members, but they didn’t have any at home. I thought this was a pretty intense move, but the boys seemed to handle it well. They made gifts for each other and their parents. They got super excited about delivering the gifts they purchased to those less fortunate. It seemed to make a huge impact on them. Now, I do not want to go that far with the girls. I know that they are still young and they get caught up in the Christmas spirit. We keep reminding them of what the meaning behind Christmas is and that there are a lot of less fortunate people in our community and throughout the world. We want to emphasize this part of Christmas and also make sure they are aware that people need help year round. We bought a gift for a family our church ‘adopted’ through Grace Connection in Towanda. The girls were excited to shop for a little boy who may not have gotten any or maybe just a few gifts. During our church service last week, I learned how the Grace Connection came to be from the church’s Sunday School Superintendent and Ad Council representative Brooke Hatton. It was definitely a moving story. Three years ago, founder Judy Smith asked a mother how her Christmas was. She replied that it was half good and half bad. The mother explained to Judy that the Salvation Army only donates gifts for children under 12. She had two children under 12 and two over 12. That Christmas her older children sat by and watched their younger siblings open gifts while they had nothing. At that moment, Judy decided she was starting Grace Connection. 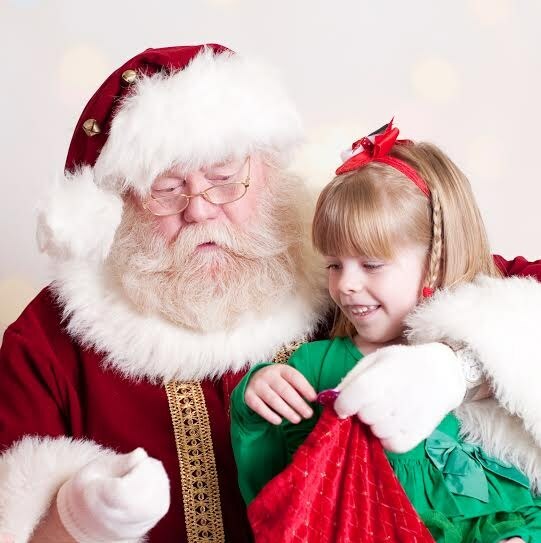 Each year she has approximately 60 families in need sign up to be ‘adopted’ during the holiday. This year 14 families went unadopted. Monetary donations help and she gets gift cards for those families. They also help families who need fuel for their homes and utilities. Our family has also decided to take part in the Heifer International Program (www.heifer.org). I was surprised how quickly the girls jumped on this idea of purchasing animals for families in need. They eagerly went through the catalog marking what our family was going to buy. Katherine read through the catalog and learned how each animal helps a family or even a village and what it means to them. These animals are not a one-time gift. They are not just used for food, but can also help a family bring in a reliable income. Katherine was very surprised to learn that we could also give a donation to help a young girl receive an education. I know she has heard of children not getting an education, but reading the catalog and seeing the pictures seemed to move her. Last Saturday, Katherine and I also helped ring the bell for the Bradford County branch of the Salvation Army’s annual kettle drive at Connie’s Market. She thought that was super fun and came to the conclusion that children definitely bring in more donations than adults. I do believe she is on to something there. I can see how this experience has made an impact on her by helping those in our community. She is learning about what it is to give; whether it is time or money or gifts. This time of year shouldn’t just be about receiving. 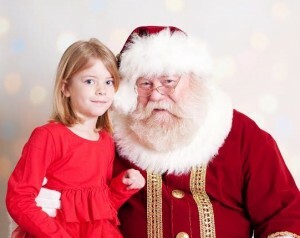 Yes, she has a pretty long list of items she wants Santa to bring. AND…she has been pretty good this year (only one incident on the bus!). I don’t want the girls to lose sight of what is happening around us; especially in our community. I know that there are so many campaigns for people around the world that need our help, but I think that there is a pretty substantial need here at home too. Granted, they still shout out to have me come see what is on TV that they “really, really, really” need and want. We go shopping, and they will ask for something every time. Sometimes they take no better than other times. I try to start the shopping adventure as we leave the house, informing them that this isn’t a shopping trip for them. That doesn’t always work. I love listening to what other parents have their children or the entire family do during the holidays to help others. It gives me ideas, and it is a great example to share with the girls. When they see their friends are out there helping to make a difference, they want to do it too. We have really only just begun getting the girls involved with reaching out to others. This is a work in progress, like so many other things in parenthood.